Ulcers are defined as abnormal breaks in the skin or mucous membranes. They can be caused by a wide number of pathologies and have a prevalence of approximately 1%. The majority of lower limb ulcers have a venous origin (80%), with other common causes including arterial insufficiency and diabetic-related neuropathy. Rarely, they can also be caused by infection, trauma, vasculitis or malignancy (typically squamous cell carcinoma). 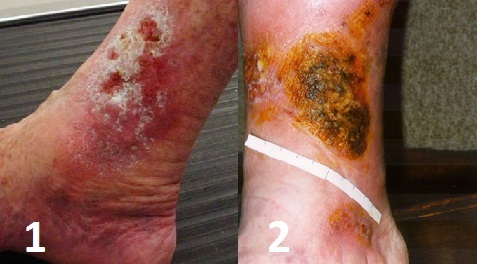 It should be remembered that in patients who are less mobile, ulcers may also be caused by prolonged or excessive pressure over a bony prominence (pressure ulcers), leading to skin breakdown and eventual necrosis. In the hospital setting, these pressure ulcers should be managed by adequate mattresses to aid repositioning and good wound management. This article will discuss the three main types of causes for ulcers – venous, arterial and neuropathic. Their pathophysiology is poorly understood. It is thought that valvular incompetence or venous outflow obstruction leads to impaired venous return, with the resultant venous hypertension causing the “trapping” of white blood cells in capillaries and the formation of a fibrin cuff around the vessel hindering oxygen transportation into the tissue. The white blood cells subsequently become activated, with the release of inflammatory mediators leading to resultant tissue injury, poor healing, and necrosis. Venous ulcers can be painful (particularly worse at the end of the day) and are often found in the gaiter region of the legs (Fig. 1). Associated symptoms of chronic venous disease, such as aching, itching, or a bursting sensation, will be present often before venous leg ulcers appear. On examination, there may be varicose veins with ankle or leg oedema, as well as features associated with venous insufficiency, including varicose eczema or thrombophlebitis, haemosiderin skin staining, lipodermatosclerosis, or atrophie blanche. The diagnosis of venous ulcers is clinical, with the underlying venous insufficiency confirmed by Duplex Ultrasound. Most commonly venous incompetence occurs at the sapheno-femoral or sapheno-popliteal junctions, although it may occur in any perforator. An Ankle Brachial Pressure Index (ABPI) is required to assess for any arterial component to the ulcers and to determine whether compression therapy will be suitable. If infection is suspected (i.e. erythematous or with purulent exudate) then consider microbiology swabs and antibiotics. Take swab cultures if suspecting an associated infection. Consider a thrombophilia and vasculitic screening in young patients, especially if there is a suspicion or family history of prothrombotic and autoimmune diseases. Conservative management for venous ulcers warrants leg elevation and increased exercise (promoting the calf muscle pump action which aids venous return). Encourage lifestyle changes, including weight reduction and improved nutrition, as appropriate. Antibiotics should only be prescribed with clinical evidence of a wound infection (most wounds are colonized, therefore swab results should only be acted upon if evidence of infection). The mainstay of management is via multicomponent compression bandaging, changed once or twice every week; 30-75% of venous leg ulcers will heal after six months of compression therapy. Eight randomised clinical trials demonstrated improved time to healing with compression versus no compression treatment. Importantly, the ABPI must be measured as at least greater than 0.6 before any bandaging is applied. Appropriate dressings and emollients are crucial in maintaining surrounding skin health. If there is concurrent varicose veins, these should be treated with endovenous techniques or open surgery*, as improving venous return will allow for the healing of the venous ulcers. An arterial ulcer refers to an ulcer caused by a reduction in arterial blood flow, leading to decreased perfusion of the tissues and subsequent poor healing. They often form as small deep lesions with well-defined borders and a necrotic base. They most commonly occur distally at sites of trauma and in pressure areas (e.g the heel). A patient with a suspected arterial ulcer is likely to give a preceding history of intermittent claudication (pain when they walk) or critical limb ischaemia (pain at night). The ulcer may be painful and often develops over a long period of time, with little to no healing (therefore no or little granulation tissue). Other associated signs include cold limbs, thickened nails, necrotic toes and hair loss. On examination, the limbs will be cold and have reduced or absent pulses. In pure arterial ulcers, sensation is maintained (unlike neuropathic ulcers). Assess for signs of venous insufficiency, as some patients have mixed pathology. Any suspected arterial ulcer warrants an Ankle Brachial Pressure Index (ABPI) measurement, which can further quantify the extent of any peripheral arterial disease (>0.9 = normal; 0.9-0.8 = mild; 0.8-0.5 = moderate; <0.5 = severe). The anatomical location of any arterial disease can be assessed by clinical examination, followed by imaging. This includes duplex ultrasound, CT Angiography, and / or Magnetic Resonance Angiogram (MRA). Conservative – All patients should be advised lifestyle changes, including smoking cessation, weight loss, and increased exercise (specific supervised exercise programmes are available). Medical – Suitable pharmacological cardiovascular risk factor modification should also be prescribed, including statin therapy, an antiplatelet agent (aspirin or clopidogrel), and optimisation of blood pressure and glucose. Surgical – Angioplasty (with or without stenting) or bypass grafting (usually for more extensive disease). Any non-healing ulcers despite a good blood supply may also be offered skin reconstruction with grafts. A neuropathic ulcer is one that occurs as a result of peripheral neuropathy. In peripheral neuropathy, there is a loss of protective sensation. which leads to repetitive stress and unnoticed injuries forming, resulting in painless ulcers forming on the pressure points on the limb. Concurrent vascular disease will often contribute to their formation and reducing healing potential. Neuropathic ulcers can develop with any condition with peripheral neuropathy, the most common being diabetes mellitus and B12 deficiency. Ulcer risk is further compounded by any foot deformity or concurrent peripheral vascular disease. Patients with neuropathic ulcers typically have a history of peripheral neuropathy (although sometimes they may be unaware) or symptoms of peripheral vascular disease. Other clinical manifestations of the neuropathy may include burning/tingling in legs (painful neuropathy), single nerve involvement (mononeuritis multiplex, such as CN III or median nerve), or amotrophic neuropathy (painful wasting of proximal quadriceps). On examination, neuropathic ulcers are variable in size and depth, with a “punched out appearance” (Fig. 3). They occur most commonly on sites of pressure on feet (e.g. metatarsal heads or heels). Additionally, there may be a peripheral neuropathy (classically in a ‘glove and stocking’ distribution) with warm feet and good pulses (unless element of concurrent arterial disease). Blood glucose levels should be checked (either random glucose or HbA1c %), in addition to serum B12 levels. Concurrent arterial disease should be assessed with an ABPI +/- duplex. Signs of infection require a microbiology swab and any evidence of deep infection (e.g. visible bone or ulcers extending into joints), may warrant an X-ray to assess for osteomyelitis. It is important to assess the extent of peripheral neuropathy which can be done using the 10g monofilament or Ipswich touch test, along with testing vibration sensation with a 128Hz tuning fork. Many centres will have specialised diabetic foot clinics for patients with neuropathic ulcers, where they are managed via a full multidisciplinary (MDT) team. Diabetic control should be optimised, targeting HbA1c <7%. Improved diet and increased exercise (within limits) should be encouraged, and any cardiovascular risk factors present managed accordingly. Ensure regular chiropody to maintain good foot hygiene and appropriate footwear provided (e.g. non-weight bearing shoes). Any signs of infection will warrant swabs taken and antibiotics (e.g. flucloxacillin) started. Ischaemic or necrotic tissue may require surgical debridement. In severe cases, necrotic or infected digits may need amputation. Neuropathic ulcers can be seen alongside Charcot’s foot. This is neuroarthropathy whereby a loss of joint sensation results in continual unnoticed trauma and deformity occurring. The deformity predisposes the patient to neuropathic ulcer formation. Patients present with swelling, distortion, pain (typically less than may be expected with such a deformity), and loss of function. 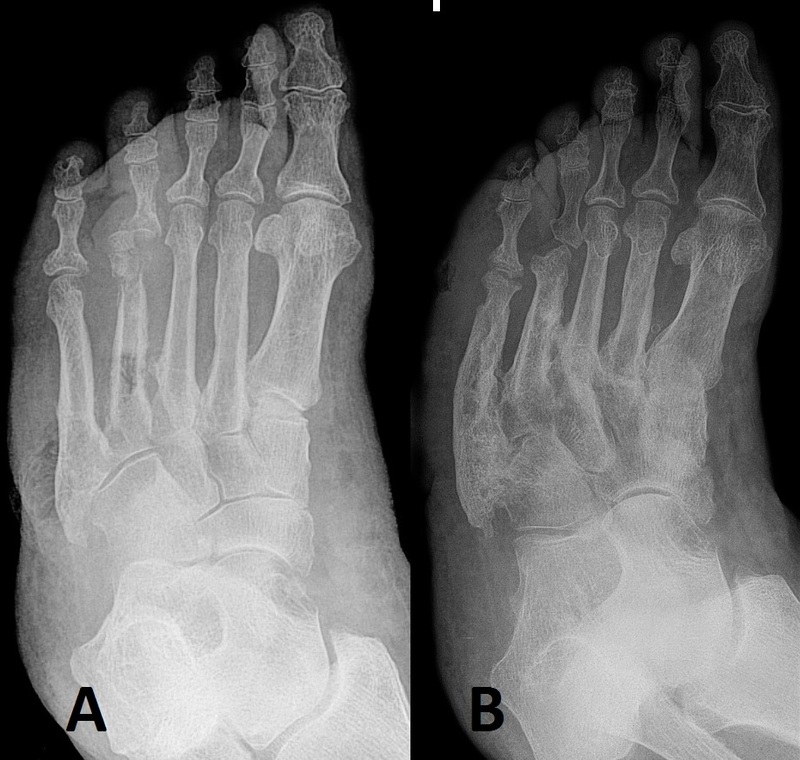 Any deformity causing the loss of the transverse arch is termed a “rocker-bottom” sole (Fig. 4). Charcot’s foot requires a specialist review for consideration of off-loading abnormal weight, and sometimes immobilisation of the affected joint in plaster. What test must be performed before applying multilayer compression bandaging for venous ulceration? Which of the following is not a cause of peripheral neuropathy? Which of the following clinical features is most associated with arterial ulcers?